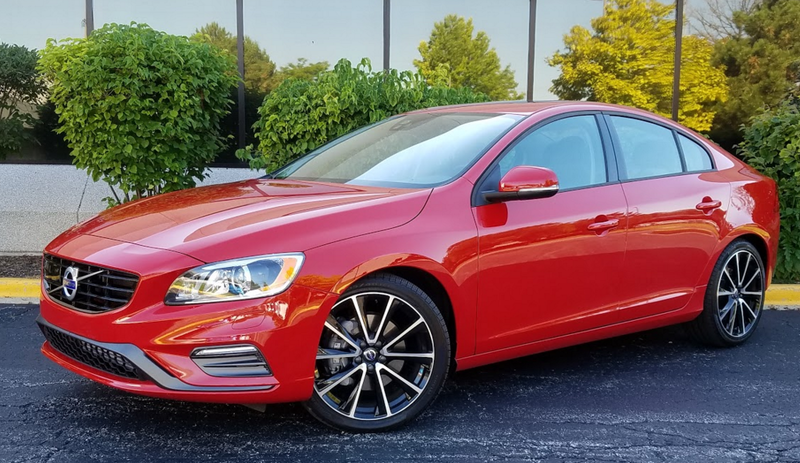 Test S60 came in all-wheel-drive T5 form, meaning it was powered by a 240-horsepower 2.0-liter turbocharged four. It started at just under $37,000 with destination, but options pushed it to $44,195. As Volvo is in the process of rapidly redesigning its entire product portfolio, the S60 T5 we drove is possibly in its final year in this form. Certainly its “old school” interior layout contrasts sharply with the trendy designs of the company’s recently updated XC90 flagship SUV and S90 flagship sedan, but that doesn’t mean the S60 is dated. Volvo built its reputation on safety, and the tested S60 had its share of high-tech safety features — though most were optional. Added in the $1500 Technology Package were forward collision warning and mitigation, pedestrian and cyclist detection, driver-alert control, lane-keep assist, road-sign information, automatic high beams, and adaptive cruise control. The $1950 Vision Package brought a rearview camera, blind-spot detection, rear cross-traffic alert, rear-obstacle detection, and a few other features. 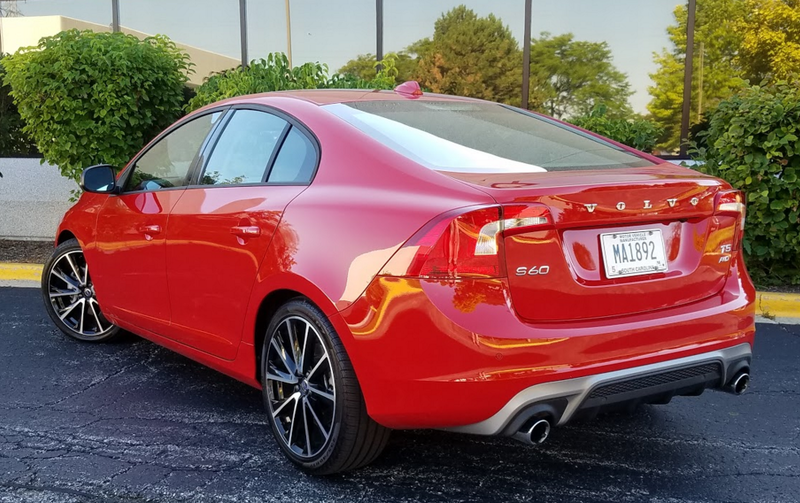 Powering the S60 T5 is a turbocharged 2.0-liter 4-cylinder engine rated at 240 horsepower. (The pricier T6 version has a turbocharged and supercharged version of the engine that makes 302 horsepower.) It’s tied to an 8-speed automatic transmission , and in our test car, all-wheel drive. This combination proved adequately powerful for its mission, if not particularly economical. The powertrain provides a decent full-throttle jump off the line, with more power coming on about 20 feet out — typical for small turbocharged engines — and the transmission kicks down fairly quickly for passing. Standard is a quite unobtrusive start-stop system, which shuts the engine off while sitting at a stoplight. Yet in 488 miles of 71 percent city driving, we averaged an unimpressive 21.7 mpg, which doesn’t even match the EPA’s 23-mpg city rating. At least you can get by on regular-grade gas. Volvos aren’t as cushy as they once were, as the company has aimed at a more sporting demeanor of late. But the T5 rode reasonably well, with fine handling and rather quick steering. It’s inside where the S60 shows its age, though mostly gracefully. You don’t often see cars with real buttons and knobs in their control panels any more, and you might not be seeing them much longer from Volvo. Ahead of the driver is a large, circular, analog tachometer with an inlaid digital speedometer — a combination that was easy to read at a glance. (The redesigned Volvos use virtual gauges that come off looking a bit video-gamey.) The audio/phone/navigation/climate controls were mostly made up of a slew of traditional buttons and knobs — we counted 32, including 10 physical station pre-select buttons (!?! ), and a few took a bit of study — with some odd but easily figured out physical climate controls. In fact, about the only things left to the non-touch dashboard screen were the navigation maps, the rearview-camera display, and virtual seat-heater buttons. The redesigned XC90 and S90, meanwhile, merge virtually everything into a large touchscreen with three pages that you access by swiping right and left like a smartphone. Visibility is good to the front, decent to the sides and rear. However, when swung to the side, the sunvisors don’t extend, leaving a 5-inch gap for sun to shine through. There’s fine room in front for taller folks, and the driver gets a power lumbar adjustment, but not a power tilt/telescopic wheel (those adjustments being manual). But while 6-footers should find adequate headroom in back, they’ll be short of legroom if the seat ahead is moved far rearward, and a tall, wide center tunnel would make foot space sparse for anyone stuck in the middle. Small rear door openings restrict egress just a bit, particularly for larger feet. Materials are of nice enough quality, though they’re hardly flashy. The all-black of our test car was set off by a silver center panel and silver trim, and though the dashboard, door tops, and armrests had padding, there wasn’t any too much of it. Storage space consists of a decent-size glovebox, a small under-console bin, two covered cupholders with a 12-volt plug, a small console bin with Aux and USB jacks, and small map pockets in the doors. Trunk space isn’t the best — or the most versatile. The trunk’s sickle-shaped hinges dip into the cargo area, eating some space, but they’re covered to protect against damage to luggage. 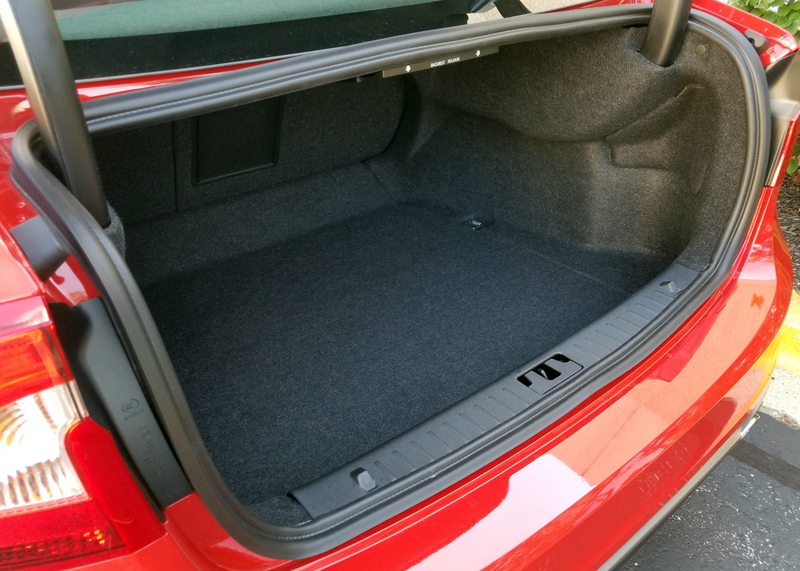 There’s no official underfloor storage (just a bit of “unofficial” space around the spare tire), and when the rear seat backs are folded, there’s about a 5-inch rise from the trunk floor that’s bridged by a steep ramp that may be too steep to allow easily sliding larger items all the way forward. There’s also a ski pass-through, but the release for the door is inconveniently located on the back of the door, which means you have to fold down one of the seat backs to access it. Although the trunk is wide at the rear, it’s not very deep, and the lid hinges dip into the cargo area. The angled ramp toward the front has to be navigated to slide long items through the portal left by the folded rear seat backs. Oddly, I drove the S60 just after returning from the press introduction of the newly redesigned S90. Although the two cars are both premium midsize sedans in our book, the S90 is notably larger — and more expensive. It also represents where the brand is headed, whereas the S60 is more about where the brand has been. As such, the make’s traditional buyers may well find it the last example of a traditional midsize Volvo. For 2017, Volvo has tacked the name Dynamic onto the base T5 version of its premium-midsize S60 sedan, and it’s a name that seems to fit. It’s an all-around pleasing car to drive, even feeling almost muscular at times as the eight-speed automatic transmission tears through upshifts while the 240-horsepower turbocharged four-cylinder engine builds power. Handling is better than average for a family sedan. 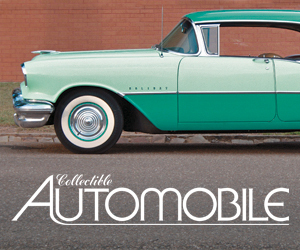 With its optional 19-inch wheels, Consumer Guide®’s test car had a ride that was a touch brittle on less-than-manicured pavement, but was comfortable for the most part. 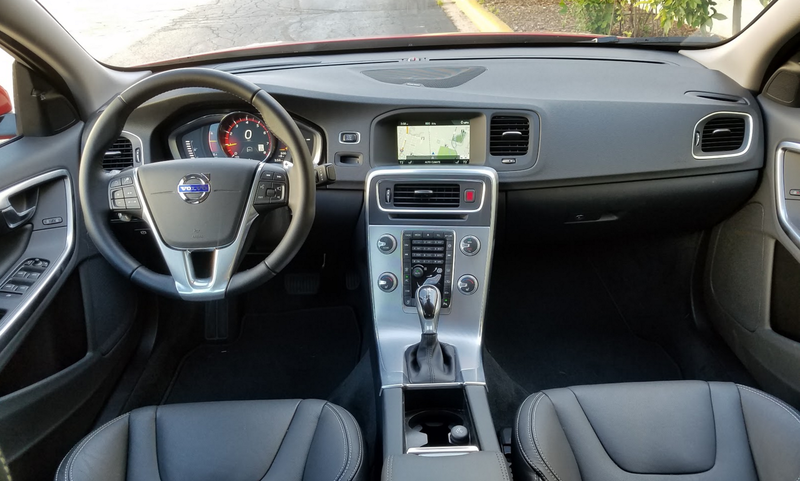 It’s also easy to pat Volvo on the back for giving the S60 decent driver sightlines (though the B-pillars are thick); almost-plump leather seats; and a relatively uncomplicated and direct control interface for audio, climate, and optional navigation. Where the S60 falls off somewhat in this review’s eyes are in rear-seat legroom and trunk utilization. You won’t get two six-footers to sit one in front of the other, and even shorter folks will have just passable room—and this car is technically a midsize, don’t forget. The trunk is wide but quickly runs out of front-to-back space, and the floor rises as it reaches the split-folding rear seats, so loading of longer objects won’t be slide-in/slide-out easy. Also, this driver couldn’t get too excited over fuel mileage from his test stint of 171.6 miles. At 21.3 mpg with 70 percent city-style driving, he didn’t even reach the projected EPA city mileage of 23 mpg. CG’s test car had a big complement of options—particularly safety technologies—that hiked the final price to $44,195, but that seems about right for a car of this class with this level of features and performance. The S60 is on the small side for a midsize premium sedan, whereas the new S90 — which is also considered a midsize — is on the large end. Though the S60 certainly doesn’t look dated, its remaining time in showrooms is likely short. Written by: The Daily Drive staff on November 3, 2016. Do I Really Need to Use Premium Gas?